With life, as it does every spring. On a recent visit to the sprawling 65,000-acre Shawnee State Forest, spring had returned with a vengeance and eveything from birds to butterflies to plants were there in droves. I can never get enough of this place; it is the closest true wilderness that is accessible to my overly-developed suburbia-dominated landscape of Columbus, Ohio. Here, we've destroyed nearly every natural feature of note. There, next to no development can be found - just massive wild landscapes. Worm-eating Warbler belts out his dry, husky trill with all the vigor of his more tropical-looking brethren, such as Hooded Warblers. Both species were back in abundance. Worm-eaters are more sluggish and methodical than most warblers. They use their relatively heavy spike-like bill to probe through hanging clusters of dead leaves for caterpillars, spiders and the lot. Quite the specialist are they when it comes to feeding habits. I've seen them numerous times in their tropical wintering haunts, and they feed the same way there. There were more birders at Shawnee this day than I think I've ever encountered there. The place is certainly on the birding radar screen these days. One was Troy Shively, who located some Silvery Blues. These small butterflies are a bit larger than Eastern Tailed-Blues, with which they sometimes fraternize, but are easily distinguished by the row of conspicuous black dots on their underwings. Dorsal, or upper, surface of the Silvery Blue. Quite a show-stopper if on a tiny scale. And one must often work hard for any sort of photo. We were scrambling about on our kness and bellies like fools trying to record this beast. Almst as if taunting us, he'd allow for a decently close approach, then wing off out of range. Many times this was repeated. This is the herbal magic that makes Silvery Blues tick. Their primary host plant appears to be Carolina Wood Vetch, Vicia caroliniana, and knowing this plant is the secret to finding the butterfly. Just locate the vetch, then look for the blue. Both species have rather limited southern ranges in Ohio. A short while back, I blogged about the beatiful and extraordinarily rare Goldenstar lily, Erythronium rostratum. Well, here's what it looks like now. It's in full fruit. That's the odd-looking capsule resting on the ground. One of our rarest, most beautiful, and interesting breeding birds occurs in the upscale Columbus neighborhood of Bexley. In the lushly landscaped upscale surroundings of large estate homes with average values hovering in the seven figures, our guys go about their business, producing awkward large-billed youngsters from conspicuous platforms of sticks located directly over quiet Preston Avenue. They've been doing this for seven years or so, and have become avian celebrities. Today, I became a visiting paparazzi, loitering below and gaping upward to admire these fascinating birds. Draped with my binos and camera, I drew nary a blink or second look from neighbors tending to their tulips or passing by on strolls. The locals have become quite accustomed to our lot, stopping by to gawk at their gorgeous Yellow-crowned Night-Herons. Columbus has long harbored small breeding colonies of this southern heron, and they've always been, at least most of them, in upscale suburbia nestled amongst the mansions. Apparently these are birds of refined tastes. I remember going to see one colony, long before I had a driver's license and thus was transported by my mother, in Upper Arlington along the Scioto River. There were quite a few nests then - I remember a half-dozen or more - and the birds were quite obvious. The residents in whose ravine the birds graced were quite proud of them, as I recall. Then, for many years there was a nest or two in heavily wooded Overbrook Ravine, in the neighborhood of Clintonville. These Columbus nests are just about the furthest north this species breeds. A common denominator in all of these sites are the nearby presence of small streams, or in the case of the old Scioto River colony, the rocky shallow tail waters below Griggs Reservoir. Yellow-crowneds in the north seem to prefer small rocky streams for foraging. Such habitats contain an abundance of crayfish and small fish like Creek Chub. Looking north along sedate Preston Road in Bexley. This unassuming street has become a beacon for visiting birders. One of the two Yellow-crowned Night-Heron nests is conspicuous, right over the street nestled in the crook of an overarching branch of one of these London Plane Trees. Or Sycamores, we really need to see the fruit to be sure. The former is a hybrid often planted as a street tree. Sometimes the nests are disparaged as flimsy, unreliable-looking structures of questionable structural integrity. Not really, at least this one. It's grown into quite a pile of sticks. There is a bird crouched on it, presumably incubating eggs. A beautiful adult. They must be quite used to the fawning admirers below, as they pay no mind - not even a glance - at the fans below. This nest was tended by three birds; likely the female on the nest, its mate standing ten feet away on a branch, and a third apparent adult nearby. The third party is probably an unmated non-breeder raised in a previous year at this site and still maintaining family ties. One more look. Adult Yellow-crowned Night-Herons, to me, rank high among our waders in terms of outright good looks. Their rarity always makes them a treat to see in these parts. And their peculiar tastes in nesting locations adds yet another strange dimension to their allure. If you find yourself in the Bexley area, stop by and pay your respects. Just stay off the lawns. On a recent expedition to southern Ohio, we encountered many rare and interesting plants. Not the least of these was a gorgeous, Lilliputian gentian. Pennywort Gentian, Obolaria virginica, is more common than may be thought, but it is easily passed by. Quite the stunner, eh? A few inches tall constitutes a whopper of a Pennywort Gentian, and some plants barely project out of the duff of last fall's leaf litter. The Gentian family is not a big one in our region, and this is the earliest of their lot to bloom. Quarter for scale. Truly a micro-gentian, but as almost always the case with the tiny and obscure, upon close scrutiny they reveal their charms. 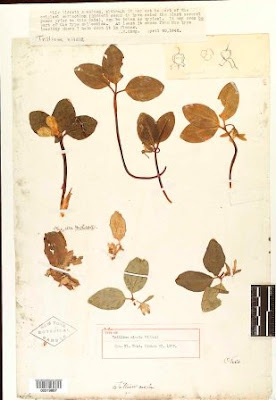 A while back, I blogged about the "discovery" of a new species. Well, we revisited the site where I found Reznicek's Sedge, Carex reznicekii, 16 years ago. And lo and behold, there it was, doing just fine on its dry oak-shaded hillside in Jackson County. Tuft of Reznicek's Sedge, looking much like a sterile clump of grass. Obscure in the extreme, sedges in this most interesting and rather showy group are often overlooked. By lying on my belly I am able to take us in closer to the "meat" of the plant. Standing upright, one would think nothing of this sedge, nor notice anything other than the clump of leaves. However, it is in full fruit and by getting down on its level and parting the foliage, we can see the fruiting clusters, necessary to examine for positive identification. Now we're right in there. This is a culm, containing both male and female flowers of the sedge. The slender, reddish-brown spikelet are the male, or staminate, flowers. The larger green beaked units below are the pistillate, or female flowers which form the fruit. In sedge-speak, fruit are called perigynia, and this specimen of Reznicek's Sedge is in its full glory. What good is such an obscure plant? Might ask an ant. Often, when a plant forms fruit very near the ground, like this species, ants are the agents of dispersal. No one knows for sure the mechanics of pollination and seed dispersal with this newly described species, though. Of all the things growing in wild Ohio, only a tiny fraction are thoroughly understood. For a good many species, we know nearly nothing about their life history. Early spring may be the best time of year to be in the hill country of southeastern Ohio. It's a particularly appealing time of year, as memories of ice, cold, and snow are still fresh. Thus, the burst of life is a welcome relief, and a reminder of the age-old turn of seasons. Pinkish blooms of Redbud, Cercis canadensis, tint roadsides magenta in Shawnee. They are joined by other less conspicuous botanical earlybirds, whose greenish casts nonetheless do much to enliven the landscape. The green mists in this photo are produced by the ripening fruit of Red Elm, Ulmus rubra, and clusters of flowers of Sassafras, Sassafras albidum. Scarcely any foliage has yet emerged, which is fantastic for birders. This situation will change rapidly, and before long our feathered songsters will be enveloped in the jungle-like leaves of the forest, and admiring them will be vastly more difficult. This tree is the first to unfurl its leaves; it is Yellow Buckeye, Aesculus flava. By last Sunday, one of the earliest spring wildflowers was already on its way out, the blossoms becoming flushed with pink. This is Trailing Arbutus, Epigaea repens, a tiny heath of dry eroding shaded slopes. This female American Robin was already sitting on a full clutch of eggs. 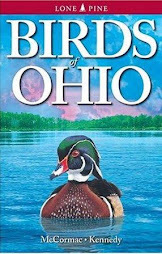 I believe this observation would qualify as "confirmed" breeding for the Ohio Breeding Bird Atlas II. And good fortune smiled upon us as we admired the robin, who was probably much less enamored with us. One of the few cars that we had seen all day in the forest came crunching along the gravelly road, and who should be at the wheel but noted wildlife photographer Jeff Wolfinger. And lo and behold, Jeff produced one of most beautiful and inoffensive reptiles imaginable, a Worm Snake! Truly a scaly stunner, these tiny animals look amazingly similar to earthworms, and when you first uncover one hiding beneath a rock, that's often the first thought people have. Alicia Elmer boldly holds the writhing serpent, displaying little or no fear. I don't think the most extreme ophidiophobe could be too worried about a Worm Snake. This is about as big as they get, and frankly, they are rather cute. Bite? Wouldn't even occur to them, and even if they tried I suspect the victim would not even notice. Snakes are a fascinating part of our natural heritage, and it's a shame that more people don't get hand's-on experiences with them, like this. Sorry for the paucity of posts of late, but Blogger has been acting bonkers lately, at least insofar as my setup goes. I've been on lots of wonderful safaris lately, with many interesting photos of some fascinating flora and fauna, so now that cyber-land once again seems accessible, off we'll go. 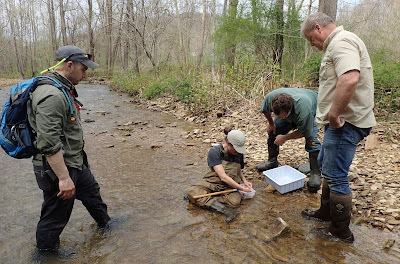 Last Saturday, fellow botanists Daniel Boone, Jim Mundy, and Ray Showman set out on a misty day to seek rarities in Jackson, Lawrence, and Vinton counties. And we found plenty. One of the major objectives was locating the two known sites of one of Ohio's rarest plants, the gorgeous yet diminutive Blue Scorpionweed, Phacelia ranunculacea. This species is a southerner at its northern limits on this side of the Ohio River. Showing the vast disparity in the progression of the vernal season, the population in northern Lawrence County was not yet in bloom - not a single flower! - although the plants had emerged and the foliage looked good. At the other site, the scorpionweed was in full bloom, down in a rich ravine within the sphere of influence of Ohio River microclimate. I'll share some photos in a moment. Phacelia is in the waterleaf family, Hydrophyllaceae, and nearly everything that we've got in this group looks good. And nearly everything in the genus Phacelia is rare here. 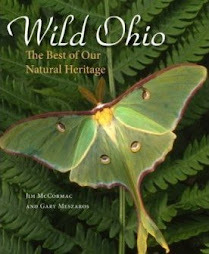 There are four species in Ohio, and three are state-listed rarities. Back in 1997, Rosemarie Boyle, then botanist for the Wayne National Forest, showed me the recently discovered and only known Ohio site for this species. The next year, I found another population at the other end of Lawrence County, the one photographed below. Interestingly, the only historical records of this species were by legendary field botanist ad farmer Floyd Bartley. He found it in "dry woods along U.S. 52, 1 mile east of Ironton" in 1952. Although not very detailed, Bartley's directions are just about where I found this plant, and may be a rediscovery of his site nearly five decades earlier. A lush patch of Blue Scorpionweed. I was thrilled to find this species, and is sometimes the case, the discovery was totally unexpected and quite serendipitous. I was slowly driving a backwater county lane, when I spotted a vigorous colony of Wood Poppy, Stylophorum diphyllum. Admiring that jumbo wildflower much, I clambered up the steep wooded slope for a better view. And wow, right at my feet were hundreds of this very rare wildflower. It must have been some sort of reward for taking the time to slog up the hill to admire the poppies. A closer view, and a closer view is really essential to getting a true appreciation of this tiny plant. The flowers are about the circumference of a pencil eraser and are quite inconspicuous. So is the foliage, as it blends with the rich growth of mesic woods erupting in a riot of other ephemeral spring wildflowers. It was good to stop back here ten years later and see that the population was still present and doing fine. That isn't always the case. I've been to more than one place on a revisit only to find that some force of man had obliterated the plant and habitat I was seeking. Indeed, the adacent hillside of this valley had been completely clearcut since my last visit. Had that been done where this scorpionweed was, it would have been curtains for it, at least for decades until the forest regenerated sufficiently. As we puttered slowly down another rural Lawrence County lane, I looked up to see a bold male Sharp-shinned Hawk aggressivley standing in the middle of the roadway, seemingly ready to hold his ground. A closer look revealed that he had prey in his talons, and we had interrupted his meal. We watched, he glared and plucked, allowing me some nice photo ops of this sensational little accipiter of rather violent disposition. A quick thought on the cowbird, and something I often think of when someone erupts over the culling of Double-crested Cormorants along the Great Lakes in an effort to reduce damage to native island flora and other colonial nesting birds. Why don't these people get inflamed about cowbird control? From their perspective, it should be equally heinous and the reasons for both species' rampant population explosions are similarly man-induced. Yet Kirtland's Warbler habitat managers have been trapping and killing Brown-headed Cowbirds for decades, in large numbers. It's funny how some activists get worked up over charismatic megafauna, but never seem to notice the less obvious microfauna. Personally, as much as I admire cowbirds, I still want lots of Kirtland's Warblers and say to the jack pine cowbirds - off with their heads! I spent Friday and Saturday along the shores of Lake Erie, which always provides interesting birding opportunities in spring. Most of the time involved activities related to Wing Watch, but I was able to get out and explore some local areas like East Harbor State Park and Magee Marsh Wildlife Area. Speaking of Wing Watch, Bill of the Birds was the keynote speaker and wowed everyone with his program. Bill has a new book out, The Young Birder's Guide to the Birds of Eastern North America, and his talk was based on that. You really should hear this program, as Bill has some wonderful thoughts and insights on getting young people out of doors and involved in nature. This should be a chief priority for all of us who are enthusiastic about the environment, no matter what age we are. Bill will also be speaking at the annual OOS conference - details right here. Following are a few photos of the 80-odd species of birds that we managed to ferret out in our limited time afield on Friday. The ducks were great, and the drakes were frisky. These are Red-breasted Mergansers, carousing in the waters of East Harbor. These seven males were hot on the heels of two females, and testosterone-laden as they are this time of year, were arrogantly prancing across the water, billowing out their shaggy crests, and feverishly vying for the female's attention. The mergs would scoot with great rapidity across the water's surface, hot on the heels of the girl, or each other. Great brouhas would erupt from time to time, with the males lunging and chasing each other about. While we watched the ducks and their antics, this bird flew in nearly overhead, high in an Eastern Cottonwood tree. No, it's not a jacamar, it's a male Belted Kingfisher, that boisterous and rather ill-tempered rattling catcher of fishes. He wasn't there long when the resident Northern Cardinal took great umbrage at his presence. Though sorely outclassed in terms of both size and hostile nature, the cardinal waded right in and let that kingfisher know in no uncertain terms that he was unwelcome, and should immediately vacate the vicinity. We, way down on the ground, wondered if Mr. Kingfisher would impale the cardinal, rap him several times smartly against the tree, and then swallow him. Whoa! Cardinal = 1 - Kingfisher = 0. The fiesty little redbird made it clear who rules the roost here, much to our surprise. The insanity of Yellow-rumped Warbler fever has begun. They were everywhere, in good numbers, but have not yet built to the crescendo that they will in a week or two. Like this male, they are all great-looking warblers, but their numbers can be so large that it can grow tiring sorting through them for non-yellow-rumps. Paying close attention to our commonest migrant warbler can pay dividends, though. Sharp-eyed Ray Hannikman found an Audubon's Warbler amongst the much more plentiful Yellow-rumped Warblers at Headlands Dunes this weekend. The Audubon's is the western subspecies of Yellow-rumped Warbler, and is quite beautiful and distinctive. Our eastern birds, when they were considered separate species from the Audubon's, was called the Myrtle Warbler. There are very few records of the western Audubon's in Ohio. Sometimes birders will refer to Yellow-rumped Warblers as "butter-butts". Here's why. This is Rusty Blackbird habitat. They favor swamps, which are wooded wetlands. There, they forage on the ground along or even in the water, or stroll along logs. Listen for their rich, squeaky gurgles, often likened to the sound a rusty hinge makes as a door is opened. This scene is along the Bird Trail at Magee Marsh. And here is a pair of Rusty Blackbirds wading about. Note the bright white eyes. That's a male on the left, female on the right. This is said to be the most rapidly declining songbird in North America, which is totally alarming. No one really knows why. Some estimates claim that we've lost about 95% of the population in the last 40 years. Read more about this issue right here. A real rite of spring for me, and probably others, is witnessing the flowering of our earliest trillium to bloom, Trillium nivale, the Snow Trillium. Aptly named, it thrusts forth from the ground so early that the plants may occasionally get buried by spring snows. It often blooms in late March, but this year seemed to be about a week later. Snow Trillium has a real history in Ohio. It was first collected and described to science by the prolific and intrepid pioneer botanist, John Riddell, in 1834 somewhere along the banks of the Scioto River near Columbus. Snow Trillium populations still persist in this area, although it is likely that Riddell's type locality (type localities are sites where a species was first collected and described) has been destroyed. This sheet contains Riddell's original, or type, collection of Snow Trillium. Although this material, collected in 1834, may be 178 years old it still looks good and is holding up fine. Collections of animals and plants are vital repositories for researchers, and are now becoming even more relevant than ever. With increased sophistication in our ability to analyze DNA, these old specimens can offer up fantastic and previously unknown information. This specimen is part of the New York Botanical Garden's huge collection of type specimens. We'll look at fresh, growing Snow Trillium in just a moment. a good measure. There must be several thousand growing along a beautiful section of a small creek, in an area where the limestone pokes near the surface. This trillium likes sweet soil, and limestone bedrock is where they do best, at least on our area. Of course, there are many other interesting plants to be seen in such a site, and it would have been inappropriate to ignore those. Just starting to awake, this is a young rosette of American Columbo, Frasera caroliniensis. Sometimes known as Monument Plant, this strange member of the gentian family can grow to five feet or so in height when it blooms - sometimes much taller! A flowering columbo is truly a spectacle. The inflorescence is copiously bedecked with small, greenish-white flowers speckled with maroon. Most years, non-flowering rosettes greatly outnumber flowering plants in a colony, but in big years many plants bloom simultaneously. Always a crowd-pleaser, the Hepatica was abundant. One of our earliest spring wildflowers, Hepatica flowers come in different hues, but most of the ones at this site were white. This color form has been described as forma candida (means shining white), purple flowered plants have been described as forma purpurea, and there have been other divisions. However, they all grade insensibly into one another and probably don't warrant any specific recognition. The thick, semi-evergreen liver-spotted leaf of this Hepatica plant can be seen in the lower right corner. From that, we can identify this species as Hepatica nobilis var. acuta, or if you prefer, Sharp-lobed Hepatica. There is another distinct and common variety, obtusa, which has more rounded tips to leaves. At one time, they were considered distinct species but most authorities now submerge them into the broad Hepatica nobilis, which ranges throughout North America and Eurasia. Blue-flowered forms of Hepatica are real show-stoppers, one of the more spectacular plants to be found in the woods. Finally, here are some Snow Trilliums. Our most diminutive trillium, the flowers are quite flimsy and the petals are almost as if made from paper. The bluish-green leaves are close to the ground, and are quite showy in their own right. These little members of the lily family have a rather small overall range, and populations tend to be widely scattered and local. It certainly isn't a common species here in Ohio, and one pretty much has to know where to go to look to find them. This flower on this older plant is just starting to become suffused with pink, a sign that it is on the way out. Some evidence suggests that trillium are triggered to begin morphing to pink after they have been pollinated. If true, this may be the plant's way of telling insect pollinators not to waste their time - someone's been here, done that. One of the biggest genera in the mustard world (Brassicaceae) is Draba, or the whitlow-grasses. There are just over 100 species in North America, but nearly all are species of northern tundra habitats and high alpine haunts, or arid places of the western U.S. 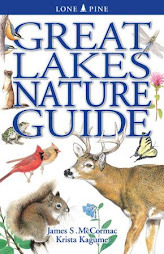 Here in Ohio, there are only three native species, and all are major rarities. I found all three on my southern Ohio botanical foray last Saturday, and two of them were looking quite nice. The third, Carolina Whitlow-grass, Draba reptans, was not quite ready yet. This is a classic Adams County shortgrass prairie, and the primary habitat that has put this county on the map botanically. These small prairies are on very thin soil over dolomite limestone, and often have Eastern Red Cedar, Juniperus virginiana, in and around them. They are far older than the tallgrass prairies of western and northern Ohio, is this region was unaffected by the Wisconsin glaciers of 12,000 years ago. Walking into one of these sites is akin to time-traveling back into some of Ohio's oldest habitats, and they are a botanist's dream. These prairies harbor some of the greatest densities of rare flora in the Midwest. One of my targets, Wedge-leaved Whitlow-grass, Draba cuneifolia. A gorgeous but VERY diminutive plant, and a very early bloomer. Most were in full flower, but a few had already formed fruit, which in mustards are termed siliques, or pods. A closeup of the basal rosette of leaves of Wedge-leaved Whitlow-grass. The whole thing is probably not even is big as a quarter. Like most little things, though, upon close inspection these mustards are filled with interesting and beautiful detail. You'll have to lay on the ground to appreciate it, though. My friend John Howard had told me what a fantastic year it is for these rare little mustards, and he was quite right. This one is called Michaux's Leavenworthia, Leavenworthia uniflora. At the sites that I saw it, there were scads in bloom. Two botanists are immortalized in the naming of this one. Dr. Melines Conklin Leavenworth was a U.S. Army surgeon, exlorer, and botanist. The legendary botanist Andre Michaux explored and described many plants from the eastern U.S. in the late 1700's. A rather cheery looking little plant, and Leavenworthia certainly adds a jolt of brightness to otherwise barren early spring prairies. It, like the other mustards in this post, require very barren rocky or sandy substrates, largely free from competing plants. Here's an entire plant, in all of its quarter-sized glory. Unlike the simple leaves of our Drabas, Leavenworthia basal rosette leaves are compound, and might remind you of other mustards such as various cresses. After a suitable period of time admiring the prairie plants, it was on to Sandy-Spring Cemetery. Located right along the Ohio River in southernmost Adams County, this cemetery contains one of rarest and best remaining examples of one of our rarest habitats, an Ohio River sand terrace. The entire bend of the river, including the cemetery, is essentially an enormous pile of sand washed into this inside bend of a huge, sweeping curve of the river. Most of the original sand terraces are destroyed, either by agriculture or outright development. This small cemetery has many rare plants, and a particularly interesting feature is the profusion of Prickly-pear cactus, Opuntia humifusa, which is native here. Little Whitlow-grass, Draba brachycarpa. This is one of only two known Ohio sites, and amongst the furthest north known sites. I'm not sure anyone has seen the other population in a decade or so. It occurs in a cemetery along the Ohio River in Lawrence County, but that site is far better groomed than is this cemetery, and that is not a good thing for rare plants. This little plant is truly a stunner, but it is REALLY small! The backdrop of this dime gives a dimensional scale to this tiny plant. This individual was a whopper, too - that's why I chose to photograph it. While sandy river terraces is the macro-habitat of Little Whitlow-grass, this is the micro-habitat. This mustard is what might be termed a "pioneer", a species that invades newly disturbed openings, grows in profusion for perhaps a few years, peppering the soil with their copious production of tiny seeds. Then, when other plants eventually exclude it, the mustards exist in a dormant yet viable state for many years or decades as seeds in the seedbank, until a traumatic disturbance event re-opens their habitat. Historically this would have been floods; today, disturbance associated with the excavation of graves. I'm looking forward to repeating this field trip next early April.